When we continue with groundwork we teach the horse to move its hind legs and front legs in and out. We learn to increase and decrease the circle with maintained bending and by that the horse starts to carry more weight on its hind legs. When you can walk backwards on a circle relatively unhindered and the horse maintains a proper distance and follows your body, so that it doesn’t fall out nor in from the circle, you can move it slightly outwards, so you can see all of the inside of the horse. As mentioned earlier, approximately so your outer leg is aligned with the inner legs of the horse. 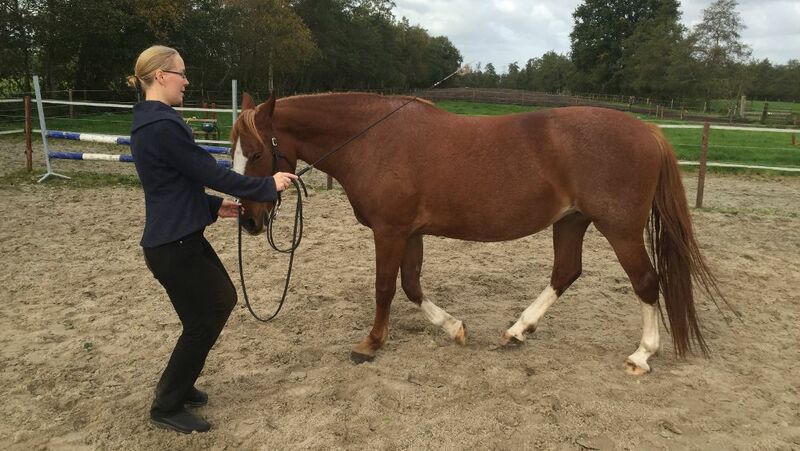 Now we want to start shaping the horse to make it carry itself properly, but in order to do that we need to be able to move the hind legs and front legs in and out of the circle. We also need to ask stelling and bending. Just as you previously practiced, stop the horse and ask it to lower its head. Take a small impulse inwards in the rein to ask the horse for stelling. Can you move on through the stelling to ask for bending of the horse’s body? Is it possible to do on both hands? Can you also do this when walking? In walking it is sometimes more difficult for the horse to bend and it may throw up its head. Just quietly continue walking and ask the horse to lower its head and ask for stelling and bending. If it is not possible in walk then stop and try in the halt, and then ask for a step. Take small steps and do not increase more than the horse can maintain its bending. The leg aids are easily taught be increasing and decreasing the circle, if the horse is following your body. If not, it may be easier to them according to what is written under “aids”. If you have diligently worked with the leading exercises the horse will follow your body and then you increase the circle by turning slightly outwards and walk outwards in a spiral. All the time you want the horse to keep its body together, i.e. maintaining its bending. If you were to take giant leap, half a meter outwards, and increase the circle in that sense there is no possibility for the horse to follow and maintain its bending. Take small steps and do not increase more than the horse can maintain its bending. When you increase the circle you also add the whip in the inner leg aid area, in rate with the inner hind leg leaving the ground. 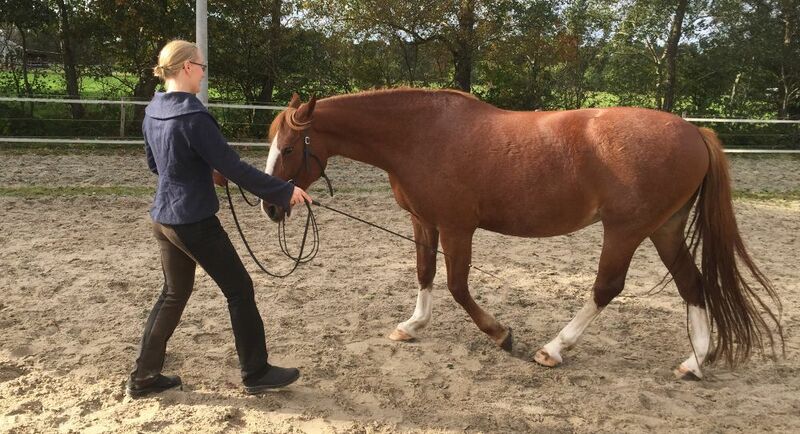 Only when the leg is lifted the horse has the possibility to alter its direction, and your body, your increase of the circle and the whip is giving an impulse to the horse to move the inner hind leg more outwards, i.e. to increase its circle. Just remember to physically increase the circle yourself. It is very easy to think to increase, you turn your body and think like mad to get everything right, and end up walking in a spiral inwards, i.e. physically decreasing the circle. Turn slightly outwards and walk in spiral outwards when increasing the circle. Outer leg aid is easily taught by reducing the circle. Turn your body slightly inwards, decrease the circle in a spiral shaped motion and maintain the bending. Then lift the whip over the back of the horse and point towards the outer hind leg. And again, do not forget to physically decrease the circle. Turn slightly inwards and walk in a spiral inwards when decreasing the circle. The rein aids you already taught the horse when teaching it to follow your body. Whip on inner shoulder meant move the shoulders outwards and when you used the whip under the throat on the outside you asked the shoulder to move inwards. To make it a bit easier for you we also want to move the shoulder inwards by moving the whip over the withers and point towards the outside. Walk backwards and focus on the front part. Move it out and in using your body language, and when the horse is moving its shoulders inwards, you add the whip on the outside shoulder, above the withers. Soon it is obvious to the horse to move its hind legs and shoulders in and out form the track. Then the gymnastic work can start to take over after the pedagogical work, when teaching the aids. Increase the circle by turning outwards and move outwards in a spiral. Reduce the circle by turning inwards and move inwards in a spiral. Touch the whip in the inside leg aid area when increasing the circle to teach the inner leg aid. Lift the whip over the back and point towards the outer hind leg when reducing the circle to teach the outer leg aid.